Washingtonians are seeing red -- Nats red, that is. 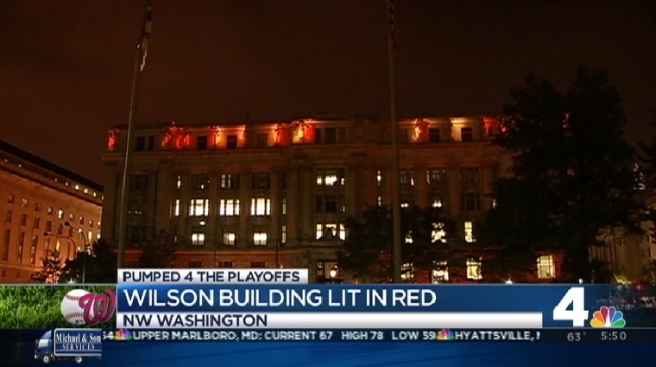 The Wilson Building in downtown D.C. is illuminated in red lights as a symbol of support for the Washington Nationals. The celebratory lighting arrangement kicked off Wednesday night. After a record-breaking season, the Nats start their MLB playoff run Friday night. So as long as they remain in the playoffs, the historic city hall -- also known as the John A. Wilson building -- will be red. Mayor Vincent Gray and D.C. Council members announced the change in a news release Wednesday. "As a lifelong baseball fan, I am extremely proud of the Nats," Gray said. "We're going to turn the Wilson Building red to show everyone that the District is behind them 100 percent." The Nats were last in the playoffs in 2012 before they were knocked out in the National League Division Series. But if Mayor Gray's predictions are correct, this year will elicit more favorable results. "I'm excited to cheer them on all the way to the District’s first World Series win since 1924," Gray said. Gray is scheduled to attend the first game on Friday, when the Nats battle the San Francisco Giants. The Nationals were 5 and 2 against the Giants this year. Game 1 of the NLDS is set for Friday at 3:07 p.m.